Climate change affects everyone, everywhere, but developing countries are most vulnerable and it adds substantially to existing suffering. Climate change also has a differentiated impact on women and men. Existing social conditions render women more vulnerable than their male counterparts, but they are not helpless victims. Due to their role in society, women have the potential to be powerful agents of change – capable of providing solutions to several climate change challenges. Recognizing the important role that women can play in this regard, the Government of Jordan requested1 the IUCN – The International Union for Conservation of Nature, through its regional office based in Amman, to assist in the drafting of a gender sensitive Programme for mainstreaming gender in climate change efforts in Jordan. 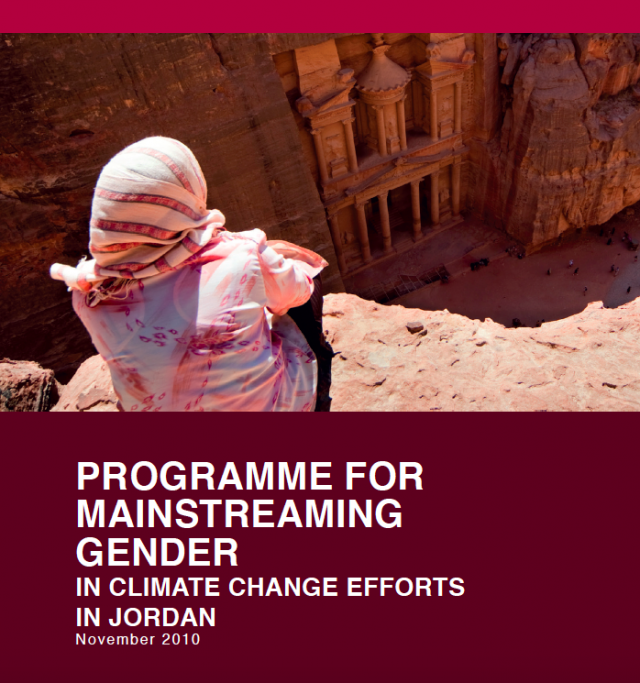 The main objective was “to ensure that national climate change efforts in Jordan mainstream gender considerations so that women and men can have access to, participate in, contribute to and hence optimally benefit from climate change initiatives, programs, policies and funds.” If adopted, it will be the first of its kind in the Arab region.